As I mentioned, my wife is away for 3 weeks ... so I have taken this opportunity to run Ethernet cat6 cable through the house. 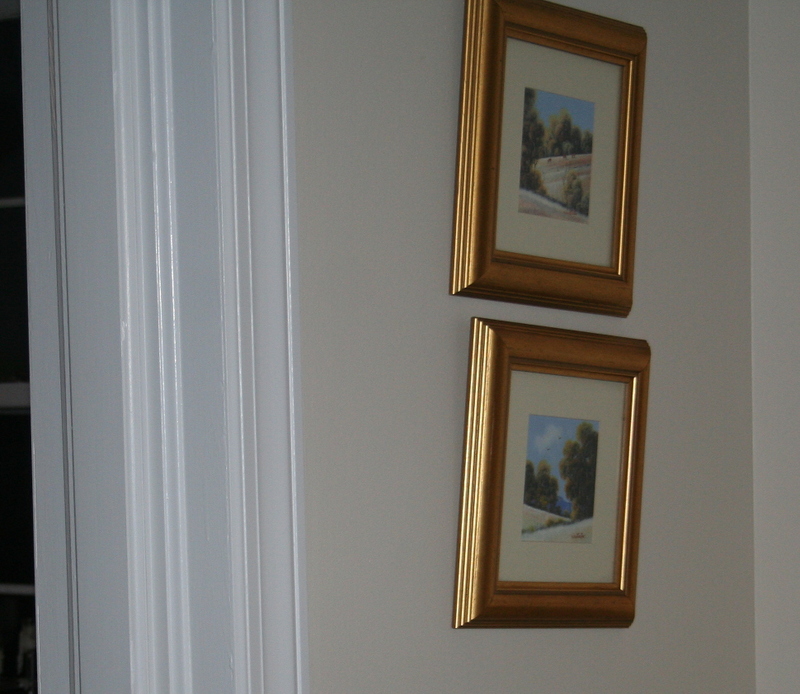 I have a thick wall in the lounge / dining room that has hidden doors in it. I am planning on opening this space up and running cable up from the basement to the 2nd floor study ... and from there to the rest of the house. The initial plan was to put the hub in the cupboard under the stairs. 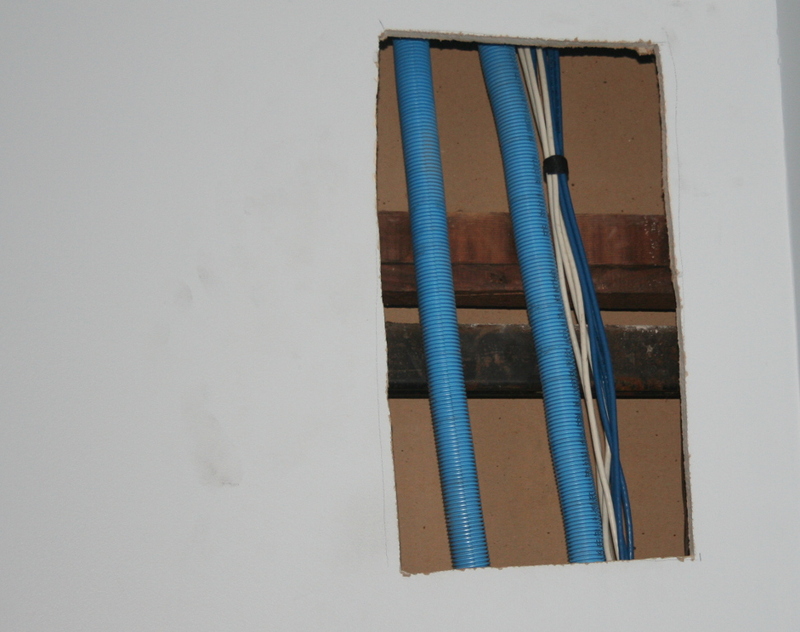 That plan changed while I was working on the cabling - the hub is now going into the basement. Here is a picture of the wall before I started anything. The most important aim of this work is to get the lounge and dining room back into a condition where my wife doesn't see that any work has been done. 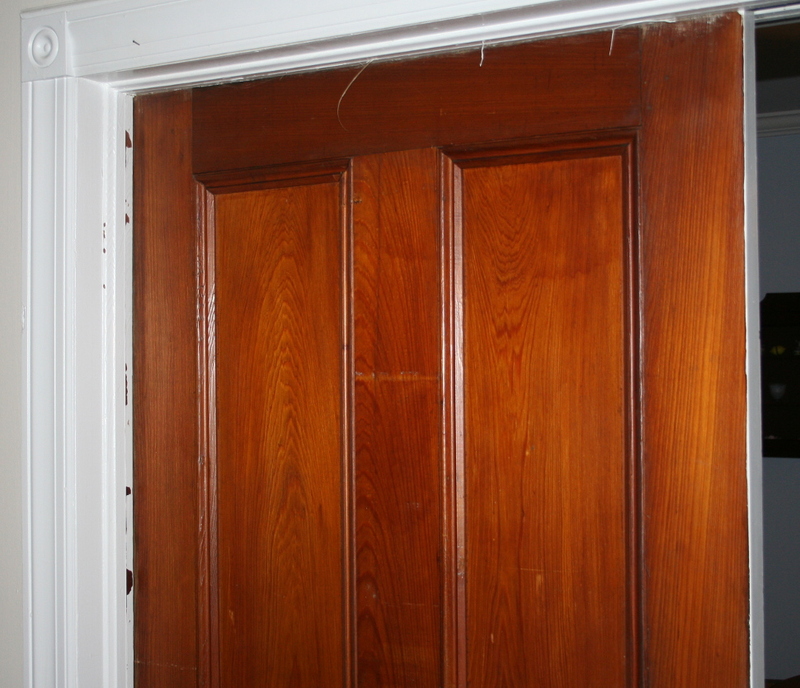 Seeing the door again actually got me thinking about a future project ... restoring both doors to full functionality. The current issue is that the track they run on (top) is crap and the doors don't glide in and out ... they stutter, limp and bemone. 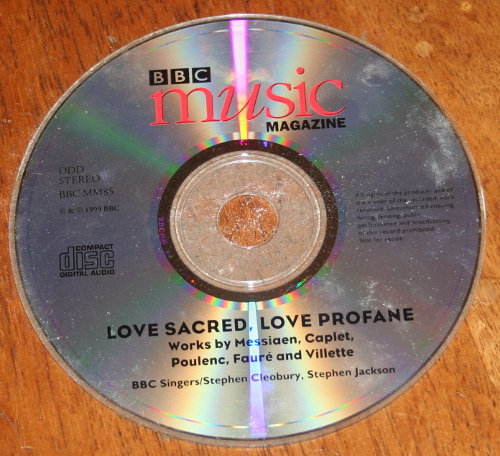 I've cleaned it and it is now playing music in my car. I wouldn't call it head banging music and it is a little slow to get going. Not sure if I will keep it or consign it to the trash can of history. While I have the wall open like I do, I've decided to install some smurf cable conduit for future requirement protection. Homedepot had some. One big problem is that it has spent its life in a coil and it doesn't want to stop. 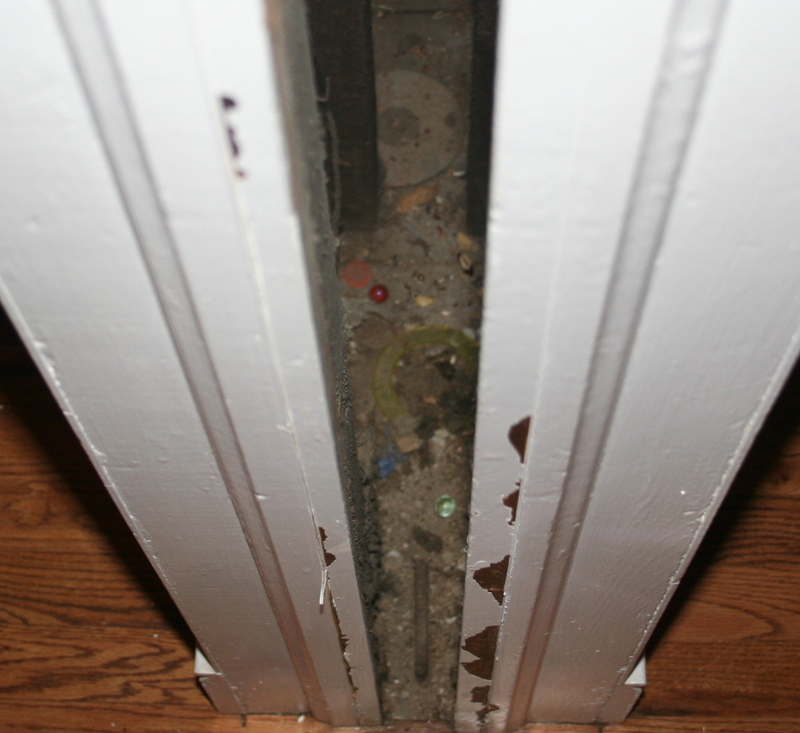 That makes running a tube from the 2nd floor to the basement difficult. Some time spent watching TV and straightening the tube was in order. 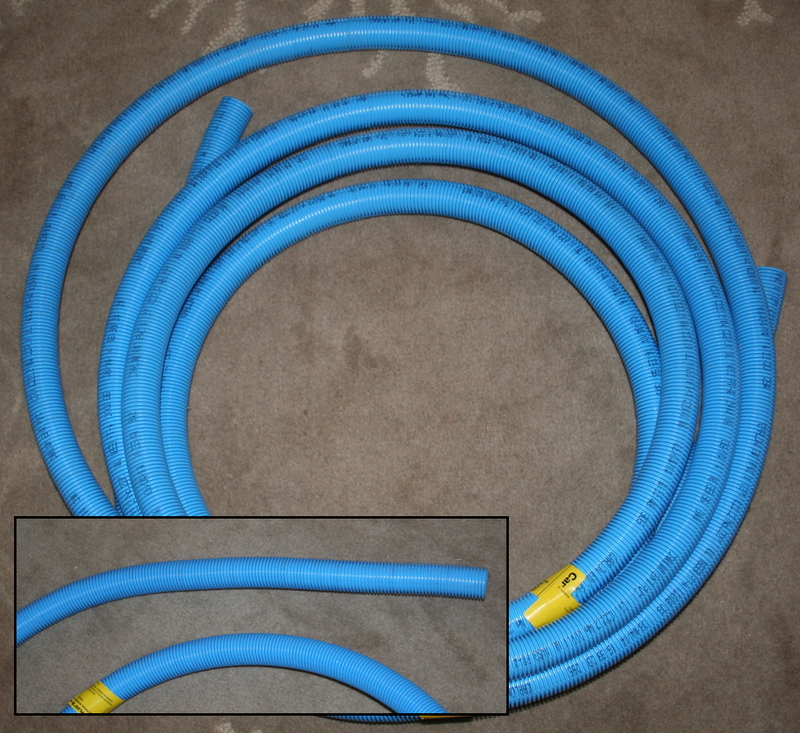 One unforseen issue was that one of my dogs was freaked out by the large blue tube and spend time trying to find a location in the TV room where she couldn't see it. The other dog was just sleeping on the dog chair. I ended up putting her in the bedroom - she was happy on 2 counts (no blue tube, time sleeping on the bed). I also picked up some stiff conduit for the cable run in the basement ... to take it from the hole in the floor to the network hub. 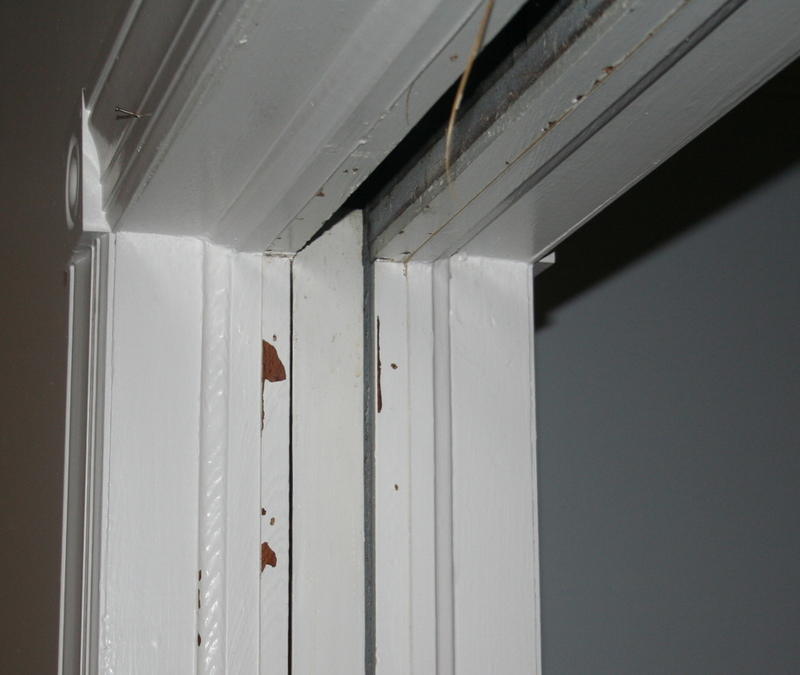 The above picture illustrates one of the many frustrations that I ran into while doing this work. The major one was that I was working in 3 areas (basement, lounge, study) and my tools where spread over those three locations. I must have spent 40% of my time just walking up and down the stairs looking for things. 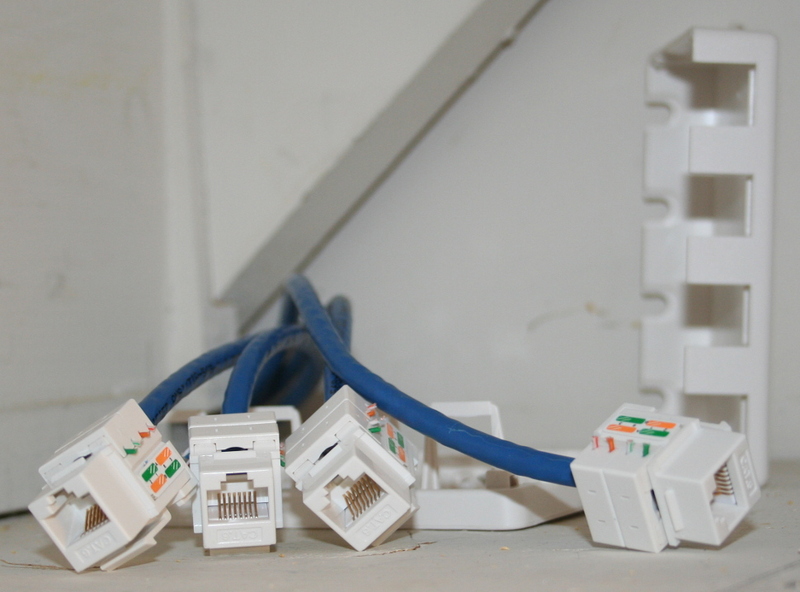 Anyway - the picture above shows one of my cabling mistakes. 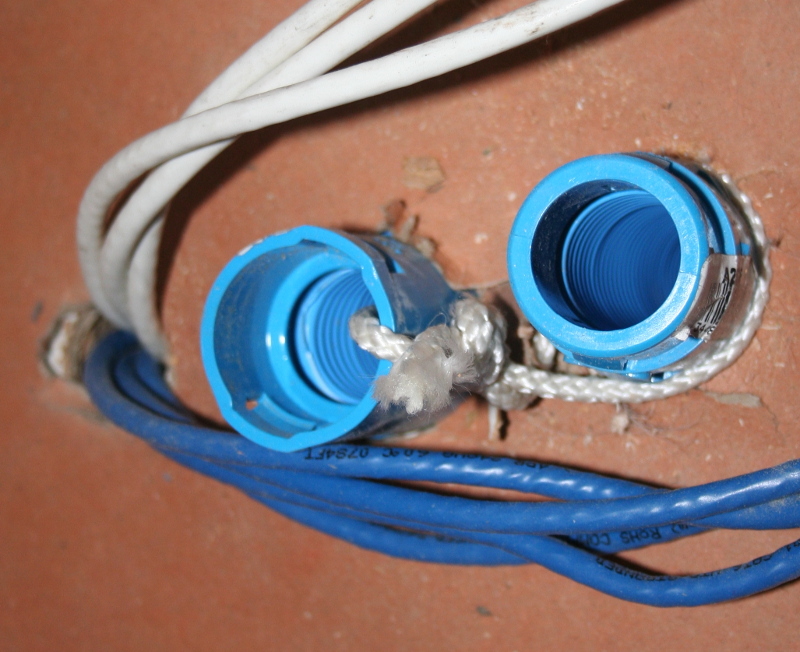 Don't feed a few cables through the conduit and then try and feed the others - do them all at once. If you do it like I did - they get stuck and you need to pull the ones already fed through back (a little) to feed in more of the 2nd lot of cable. I finally managed to get them all looking neat-ish and the other end of the conduit dumps them right where the hub is going (but that is a story for another day). 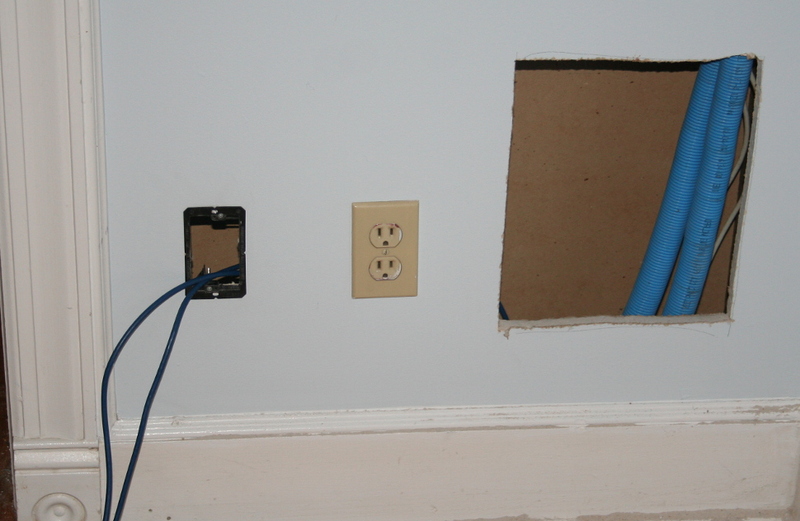 While I have the wall open, I also took the opportunity to run some Ethernet outlets into the dining room (unplanned) and the lounge (planned). I just realized that I don't have any pictures of the cupboard under the stairs. I haven't completely finished there (it actually spurred a project of a different nature) so I can add some pictures later. Edit / Update: Some pictures from the cupboard under the stairs. This cupboard is the storage location for our wrapping paraphernalia and can get fairly messy. It has a false backboard that blocks off the area of the stairs where there is no headroom. There are currently 7 cables running up from the basement into this space ... as well as two empty conduits for possible future expansion. 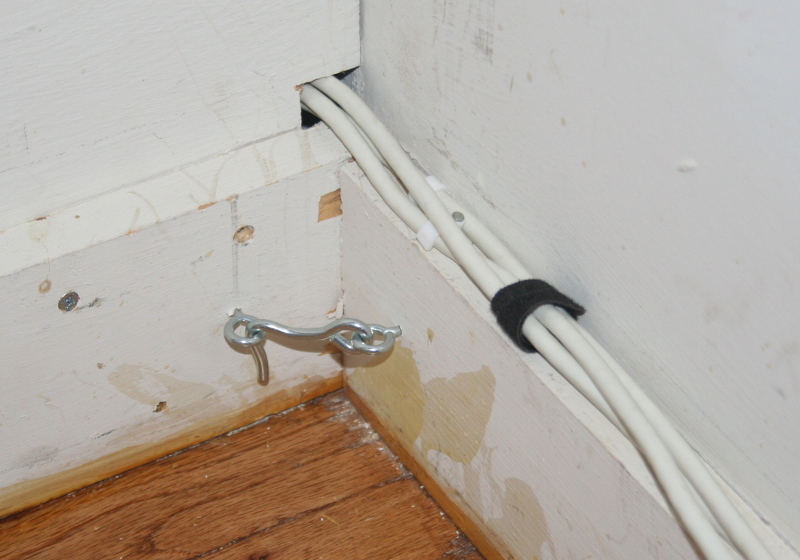 The white cables go further to the back of the desk (Study), the TV room upstairs and the master bedroom. 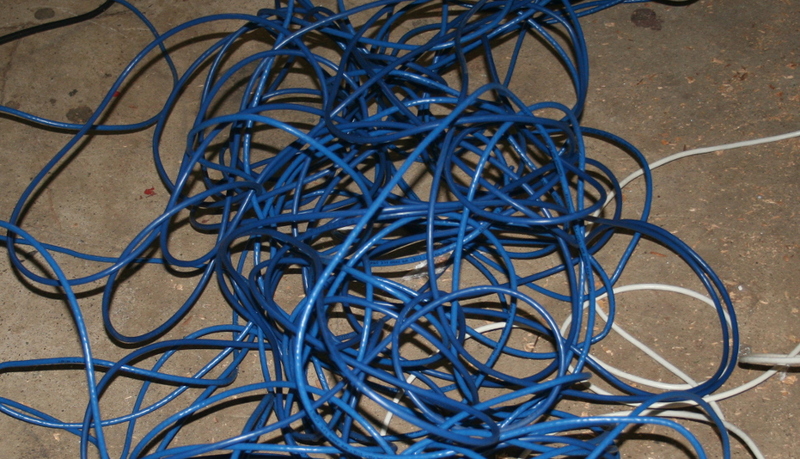 The blue cables all go up to the shelf in the cupboard. 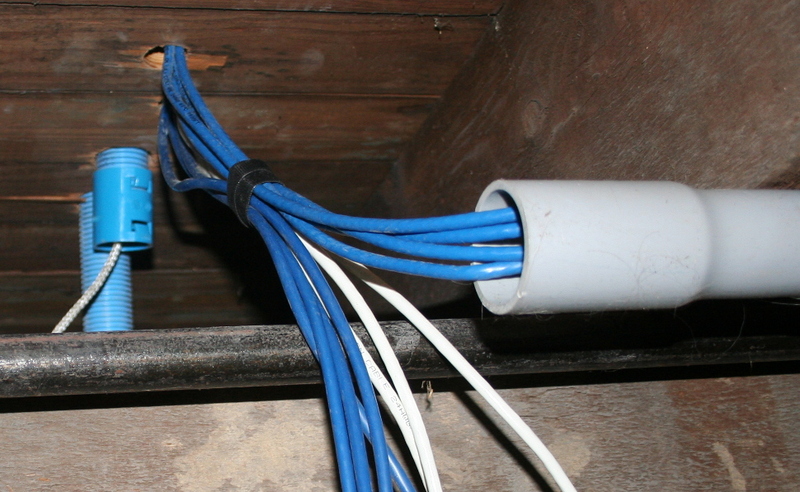 Here are the four blue cables terminating in jacks on the shelf. They are currently loose as I want to put them in the same order that I insert them into the patch panel. This will involve patching them in and then testing each one to see which is which. The wireless router / access point and sonos bridge will go here on this shelf. 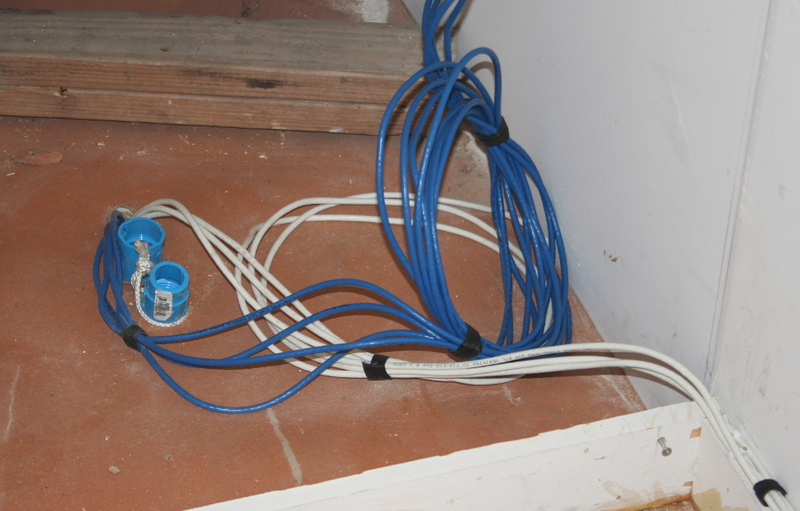 That will involve a Ethernet cable running from the cable modem (rack in basement) up to the router, a cable running back from the router to the switch (rack in basement) and then out to the other Ethernet locations. I'll patch the bridge to to the router on the shelf. Here is the finished false wall. It was nailed in pretty well originally and took me a little while to 'bust' through. I've attached the wood board at the bottom to the panel and used 2 x hooks to hold it in place. Two screws at the top attach it to the back of a stair tread. It should be easy to remove if I need to get in there again in the future. It looks a little messy (the chips in the wood, sloppy paint work, etc) but this is right at the back of a cupboard that will have wrapping paper, ribbons, etc in front of it - no one is every going to see it. 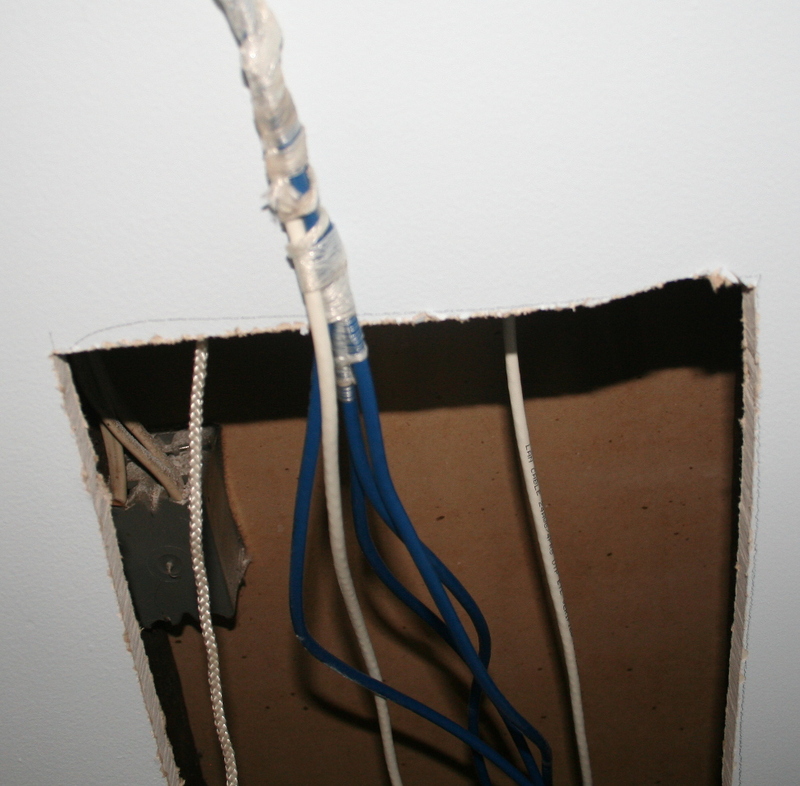 I have finished the work at ends of the wire not in the basement (punching the wire into keystone jacks) however, all wire ends in the basement are unfinished. I might finish one or two into the patch panel while I wait for the server rack project to leave the planning stage and enter the build stage.